A week long riding tour beyond the average. 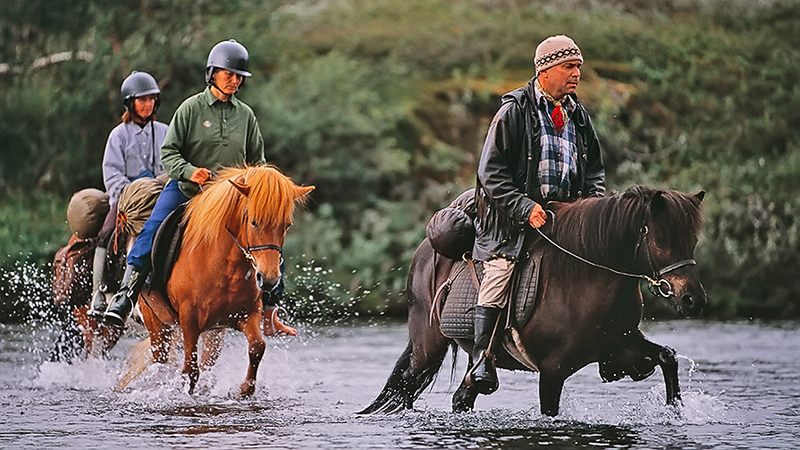 For six days we travel about six Swedish miles across untouched mountains with the Icelandic horse as companion. Accommodation in mountain hut and cots with open fire. The food is partly prepared with the primary products that the mountain land produces: reindeer, elk and mountain fish. Arrival at Ammarnäs and Fjällhästen’s hostel. Check-in at any time. Dinner is not included this evening but both the Ammarnäs Inn and the Ammarnäs Mountain Hotel are open. We have breakfast at the hostel. At about ten we gather for a briefing on our upcoming week on the mountain. We go through the equipment that shall be packed in pack roll bags that you borrow from Fjällhästen. We look at the itinerary and answer all of your questions. At noon we have lunch in Ammarnäs. 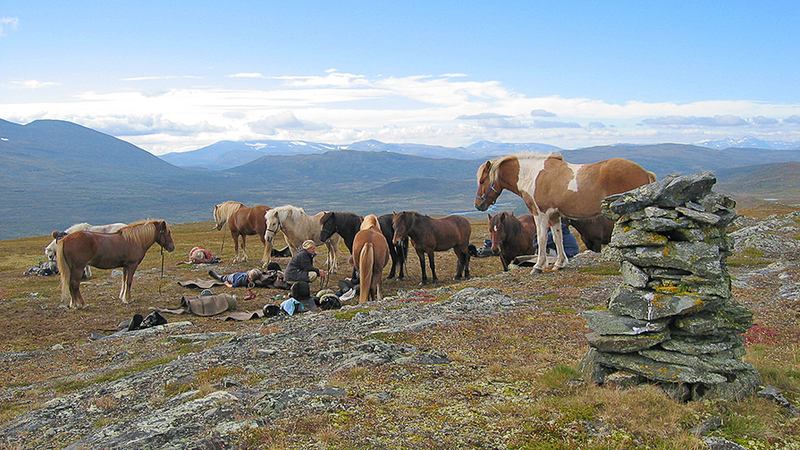 Then we go directly to our horses and prepare for departure for the destination of the first leg, Fjällhästen’s camp at Tjaskal to which it’s approximately eight kilometres of riding. From Tjaskal we ride up on the bare mountain. We ride to the northwest along the mountain Stuore Jåppe. Below us is the bird protection area Marsivagge where there are plenty of Long-tailed Skua, Rough-legged Buzzard and sometimes also Golden Eagle. After 22 kilometres we’ve reached the lake Lule Skeblejaure and our cot where we spend the night. We now continue westwards through the Skeble Valley. After 16 kilometres of riding we reach the lake Dukkejaure where we spend the night in our cot. Here we lay out nets to catch tomorrow’s dinner and the wood fired sauna is awaiting us at the edge of the lake. After a few day’s riding on the mountain it feels good to crawl into the heat of the sauna. 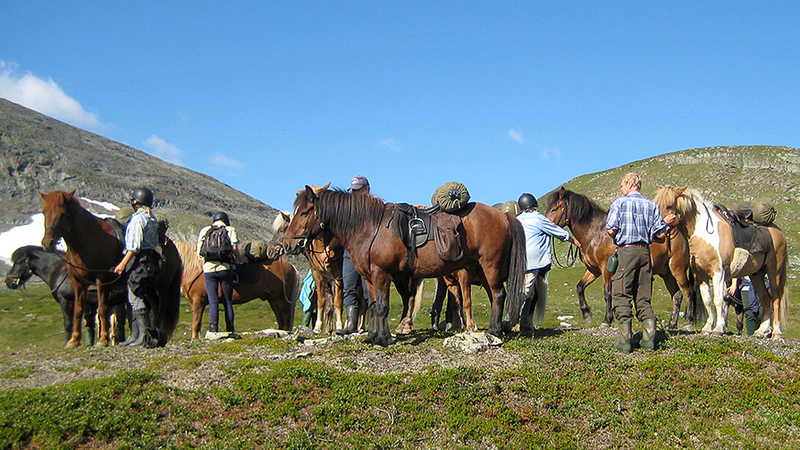 The horses carry us eastewards across the Vindel River to the mountain Björkfjället. If visibility is good we see far into Norway and we travel about 22 kilometres across the smooth and rack inviting mountain moore to our cot by Lake Framakjaure. We now continue across the vast grass flat lands on the mountain Björkfjället to our highest situated cot by Lake Båsatjaure which is about 1000 metres above sea level. During today’s riding for 16 kilometres we’ve been riding both by racking and perhaps some galloping. Today it’s time to leave the mountain world again and we ride back towards Ammarnäs. We pass the reindeer pen of Biergenis where the Sámi village of Gran lair at slaughter and parting of the reindeer. From the reindeer pen we either follow the track through the forest or the road down from Biergenis. What we choose is depending on how much rain has fallen. Once back in Ammarnäs we’ve covered a riding of 24 kilometres. After the well needed shower with adherent sauna we eat a good finishing dinner in Ammarnäs and then spend the night at Fjällhästen’s hostel. Breakfast is served at the hostel and then each and every one check out when they feel ready for further travelling towards new adventures. 13 150 SEK per person. The price includes horse, guide, food and accommodation in cot and at the hostel including breakfast.